On June 2nd Sisters of Our Lady of the Missions invited me to offer a Votive Mass of the Visitation (a special Feast in the Congregation’s Calendar) for Euphrasie Barbier Communi ty and the Sisters in St. Anne’s. 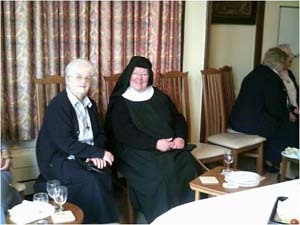 Sister Yvonne invited the Chigwell Sisters from Herne Bay, the Benedictine Nuns from Minster, the Franciscan Sisters of Littlehampton and Sister Patricia (Sister of St Anne – and a member of the Team) joined me in the celebration. The Chapel in which their Mother Foundress, Euphrasie Barbier, is buried was packed. After lunch we visited the Heritage Room and heard about the foundation and the history of the Congregation. This was followed by a very illuminating exchange about the origin and charism of the Religious Congregations present. I found the occasion interesting especially in this Year of Consecrated Life. You will remember that I mentioned in my last Newsletter that this event was to take place and as a result I received a letter from Monsignor Matthew Dickens, our Vicar General, who receives copies of our Newsletter in which he said, “… It is good to see there is so much happening with our Religious Communities. 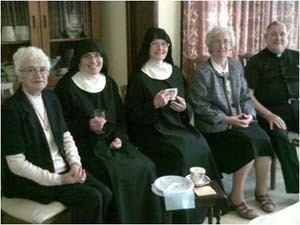 I was taken down memory lane by the letter from the Notre Dame des Missions Sisters in Sturry – my first experience of the Catholic Church was attending their ecumenical prayer group in 1970 with my (Anglican) parents. We lived in Westbere at that time. I sometimes think my journey to the Catholic Church and to the priesthood started there…. 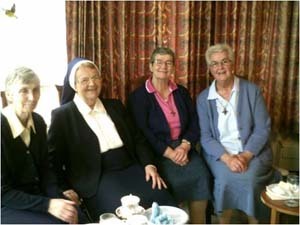 The Sisters always made me feel so welcome… some of the Sisters were up in age – one being Sister Desmond who was in to her 90’s who had spent almost all her religious life teaching in India. A wonderful soul – full of joy! Among other memories was inviting some of the Sisters to a musical evening at the Manor House in Fordwich, which at that time was the home of cellist Francesca Palmer, who became a close friend of my parents and me. The guests were subjected to me playing Chopin (extremely badly) but they were always perfectly gracious and applauded with great vigour… wonderful memories.” Now isn’t that something! And Sister Yvonne said: “It was good to hear the positive response to our Letter form the Vicar General, NO LESS!” We prayed for him (NO LESS!!) during our Mass on June 2nd.